Only showing entries about cuenca from Babies in backpacks. View entries about cuenca from all Travellerspoint blogs. Sometime after our second or third European road trip, I realized it might be possible for Mei Ling and I to see every part of Europe that we found interesting during our lifetimes. Having a car completely changes the experience of European travel. Everything is within reach as long as there's a road, and there's no need to be limited to cities and sights that are accessible to public transportation. I've already established tentative itineraries that will take us to every country in Europe except for Cyprus and Moldova. When we have a block of time available to travel in Europe I just need to pick the trip that best fits our mood and energy level. This time round I knew we would already be tired from just having dealt with all three kids on a two week trip in New England, so I picked one of the most logistically simple itineraries that would take us through familiar countries with strong tourism infrastructure. The other advantage was that we would be traveling through many of the top food and wine regions in the world on one trip. Since the main focus was going to be culinary I dubbed this trip "The Epicurean Odyssey". The germ of the itinerary lay in my long desire to visit Galicia, a region of Spain that had always fascinated me for its remoteness and intimate association with the ocean. I had visions of markets laden with endless fish and mollusks, and beautiful views from rocky cliffs at the shoreline. I was also very eager to visit Bordeaux, the only area of southern France we hadn't been to, so the logical plan was to combine both into one road trip. That naturally meant flying into Madrid, which we had visited four years earlier but had loved and vowed to return to. I decided to stretch the trip to five full weeks, which would make it our longest European road trip and allow us to include Valencia and the Dordogne region of France. We had originally planned to stop in Barcelona as well, mainly to go back to the Boqueria and the other central markets, but then realized it was a little foolish to go so far out of our way just for markets when there were so many other cities we hadn't seen. We took a red eye from Miami to Madrid, which is the ideal way for us to kick things off. The kids are all at an age where they sleep through the night, and being on an airplane doesn't seem to get in the way of that. It also allows me to work the night before we leave and get some sleep during the day. When I'm taking five weeks off I want to work as much as I can up until we leave. The downside is that I don't sleep on planes at all, except for those rare occasions when I can get a whole row to lay down in. I'm used to functioning on little sleep, especially once the adrenalin of beginning a new trip kicks in, so I'm more than willing to suffer that blow in order to hit the ground running when we arrive. One adjustment that I'd made on this itinerary was giving ourselves a major attraction to anticipate at the very end of the trip. One minor problem we'd had before was that we were only seeing lesser cities and sights in the last few days, which made it difficult to keep the energy going. On this trip we were saving the delights of Madrid for the very end. However, I did time our arrival for Saturday morning so that we could enjoy one of Madrid's many markets before setting off on the road. Our choice was Mercado de la Paz, whose location northeast of the center would facilitate a quick stop before our eastward journey to Cuenca. The logistics didn't turn out as simple as we hoped, thanks to the narrow streets and congested traffic in the busy neighborhood of Salamanca. Once we were finally able to park and made our way back to the market, we instantly recognized it as one we had already visited on our last trip to Madrid four years previously. That wasn't much of a problem though as it was a good market with plenty of food options. It wasn't as large as some other municipal markets but there was little repetition which meant all the major types of food were represented. The quality and presentation were very appetizing as well. For lunch we settled on a small seafood restaurant where the highlight was a casserole of snails in a rich brown broth. It was the type of dish one would be unlikely to find at even the most authentic Spanish restaurant in the US and it made us feel like we had truly arrived in another world. I had been a little worried about driving on so little sleep, but as we hit the highway I was feeling highly energized. I had been in Cuenca seventeen years previously, but my memories were hazy and I was looking forward to becoming reacquainted with this unique town. The best part was that we would arrive in the afternoon and still have the whole evening to explore, assuming we could continue fighting off the fatigue. Before long we found ourselves in the fairly nondescript lower part of Cuenca. Like many other central Spanish cities such as Toledo, Cuenca has a disorienting three dimensional layout that is difficult to navigate even with GPS. The old city is located at the top of a narrow ridge between the twin gorges of the Júcar and Huécar rivers. We had some difficulty locating our Airbnb, but eventually found it on a rather drab block about halfway up to the ridge. The apartment itself was fairly dreary as well, located just below the ground level with minimal interior decor and just a single window in the living room. Since we were staying just one night, we had picked the Airbnb for cheapness and convenience, and we were getting pretty much exactly what we paid for. Once we were settled it was only late afternoon, and there was no question that our best option was to head directly to the old city. One important thing to understand about traveling in Spain in the summer is how late the sunsets are. 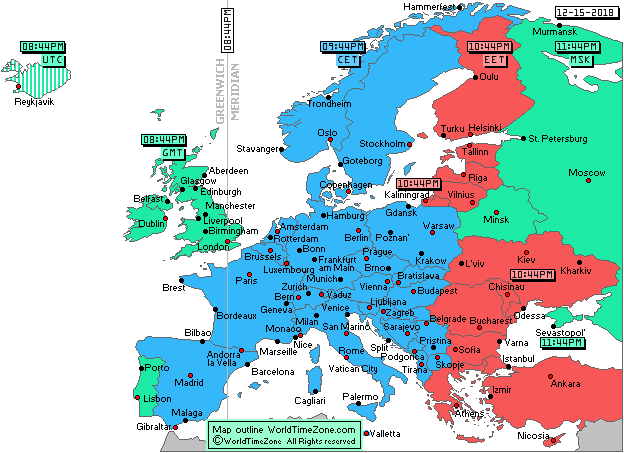 Despite being at the same longitude as Ireland and England, Spain is on Central European Time rather than Greenwich Mean Time. This was a policy instituted by the dictator Franco during World War II, in order to synchronize with his allies in Nazi Germany. In recent years there's been a movement to move Spain back to Greenwich Mean Time but it's uncertain if that will ever take place. When Spain's discordant time zone is combined with daylight savings time, the result is that sunset doesn't take place until about ten PM. Many people believe the late sunsets are part of the reason for the shift of Spanish meals and nightlife to the later hours. Regardless, when traveling in Spain in the summer it's best to do most sightseeing in the afternoon and early evening when the shops have reopened after siesta and the sun isn't as strong. Expect to have a late dinner and don't plan on being in bed before eleven. It's a dramatic difference from neighboring France where the emphasis is always getting to sleep early, waking up early, and being at the market before nine. Cuenca's old city is a no go for cars without special authorization, but there's a good-sized parking garage just below the medieval Torre de Mangana. The clock tower, which was renovated in the 20th century, isn't open to the public and the area around it is unsightly compared to the rest of the old city. However, the square around the tower offers an amazing vantage point over the lower town, the Río Júcar, and the surrounding countryside. Cuenca's Plaza Mayor is dominated by the imposing Gothic facade of the Cathedral of Our Lady of Grace and Saint Julian. At the southern end of the plaza is the town hall which straddles the main road, permitting cars to enter through an archway built into the aqueduct-like building. The plaza is a focal point of the old town, lined with cafes and upscale boutiques. 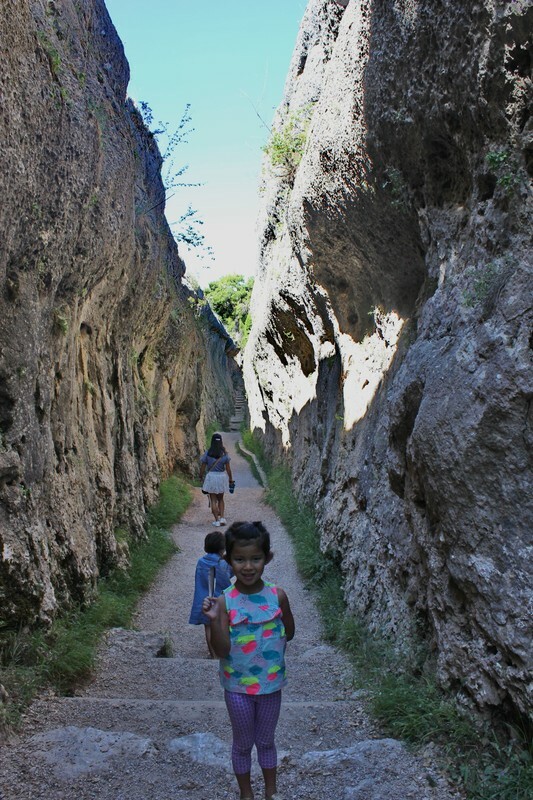 It's just a short walk from Plaza Mayor to Cuenca's most famous attraction, the Huécar gorge and the unique multistory houses that are built into the limestone walls of the gorge. There used to be many more of these casas colgadas (hanging houses), but only three remain which are now occupied by a museum of abstract art. The houses and their beautiful wooden balconies can be viewed from the cobblestone path that slopes downward to the San Pablo Bridge, or from the bridge itself. 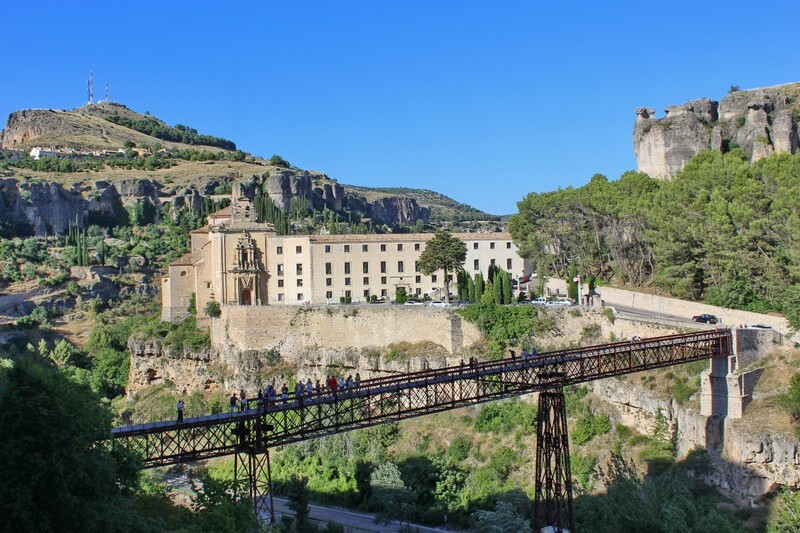 The San Pablo Bridge is an amazing structure that traverses the Huécar gorge to the enormous Parador de Cuenca, a former convent. The current steel and wood bridge was built at the beginning of the 20th century to replace the 16th century bridge which had collapsed. The bridge itself is beautiful yet seems somewhat precarious with uncomfortably wide gaps in the cross-hatched sidewalls. The kids insisted on joining me as I walked across the bridge but I refused to let go of them for more than a few seconds, which limited my attempts at photography. 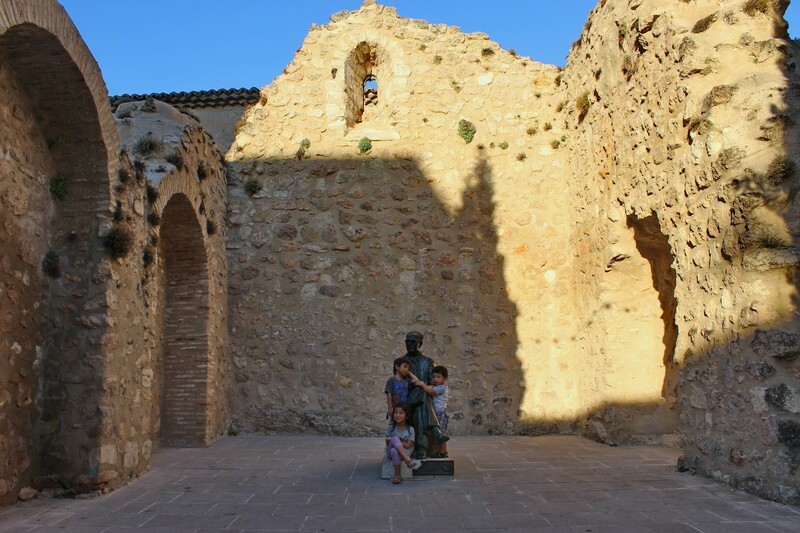 We were probably the first people in the whole town to sit down for dinner, which proved to be a disappointing meal although the al fresco location in a quiet little plaza was enjoyable. There was still plenty of light once we'd finished dinner, so we decided to continue on the main street past the cathedral and see what we encountered. 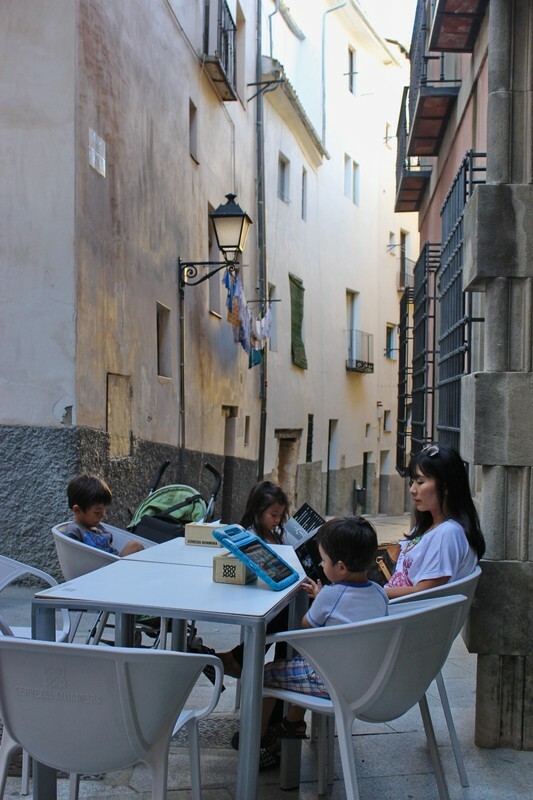 There were plenty of little nooks and crannies of the old town to explore, as the sun began to go down and the outdoor restaurants began to fill with customers. We eventually found ourselves in front of one of the most highly rated restaurants in Cuenca, and I allowed Mei Ling to persuade me to take us all inside for our second dinner of the night. I can't say the second meal was spectacular, although it was better than the first and left us feeling more satisfied with our culinary experience in Cuenca. The kids were well-behaved which was a relief. Once we left the restaurant the dusk was setting in for real and we made our way back to the car through the eerie glow of the illuminated old buildings. I was very pleased with myself for having pushed through fatigue to a normal sleeping time. Hopefully I would find myself acclimated to the new time zone immediately. I haven't really suffered jet lag for many years anyway, since I'm so accustomed to working shifts at all hours of the day and night. Once we arrived back at the Airbnb, I was grateful for the lack of sunlight that I had found depressing at first. There was no air conditioning and the warmth and stuffiness of the apartment were barely tolerable as it was. We fell asleep immediately, but in the middle of the night I woke up to the sound of the older kids whispering and scuffling in the lower bunk beneath me. I snarled at them to go back to sleep but soon realized it was futile, so I took them out to the living room and dropped them in front of the TV, then crawled back to my upper bunk and fell back to sleep. In the morning I was the first one awake and found them sprawled out on the living room floor fast asleep again. For those who have traveled with kids, this was a fairly merciful experience with their jet lag. We let them crash until the bags were in the car and then bundled them into their car seats. Our long evening in Cuenca had left us with nothing else to see in town, which was great because there was so much on the road ahead of us. 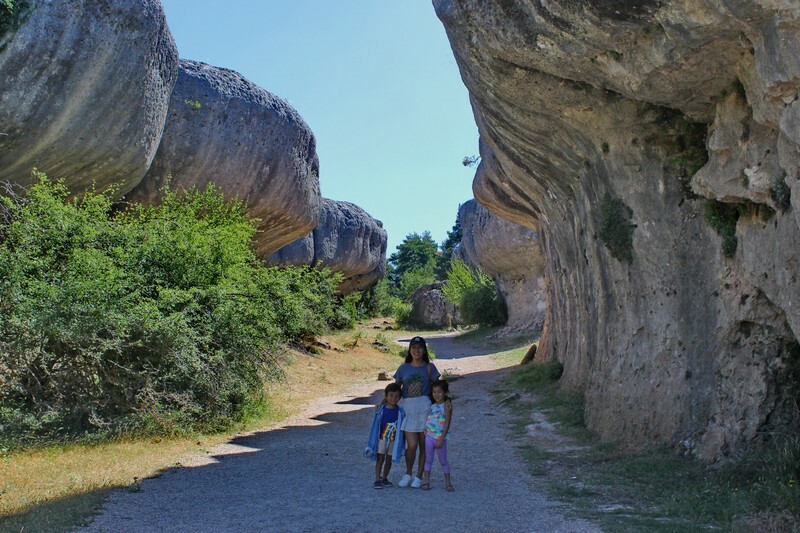 Our only other destination in the Cuenca area was the Ciudad Encantada, or Enchanted City. This fancifully-named park contains numerous unusual rock formations sculpted by the action of weather and flowing water over millennia. A common formation is a mushroom-like shape created by erosion of the base of the rock to a narrow column that seems barely strong enough to support the huge mass above it. Of course, all the formations whose columns actually did get too thin crumbled and disappeared, leaving only the ones we can see today. There were also narrow canyons, archways, and caves to explore and marvel at. It was a good way to experience some nature and sunlight on a trip that would mostly be dedicated to cities and markets. I had hoped to find a good place for lunch outside of Cuenca, but ultimately we had to drive all the way back into the new town to find a decent restaurant that was open on Sunday. We had an excellent selection of seafood tapas, so the loss of time proved worthwhile. The drive out of the Serranía de Cuenca mountains was filled with scenic overlooks. I pulled over at one stop while everyone else in the car was sleeping just to admire a beautiful display of pottery from a local vendor. The parking lot was packed with people embarking on a hike to what must have been an amazing viewpoint, but I had enough experience traveling with my family to let sleeping dogs lie.